The Mucha Collection is an exciting new series of six designs set for release from Anonymous Mint in 2017. Each of the designs recreates the brilliance of Alphonse Mucha’s imagery from the Art Nouveau movement, which was at its height between 1890 and 1910, and popular throughout the early 20th century. Today, the 5 oz Antique Silver Mucha Collection Dance Round from that series is available to you online at Silver.com. Your 5 oz Antique Silver Mucha Collection Dance Round features a unique edge lettering bearing the individual serial number of the round. This number is reflected on the Certificate of Authenticity included in the purchase of your round. Further, these rounds have a brilliant antiquing added, which brings warmth and depth to the overall design. 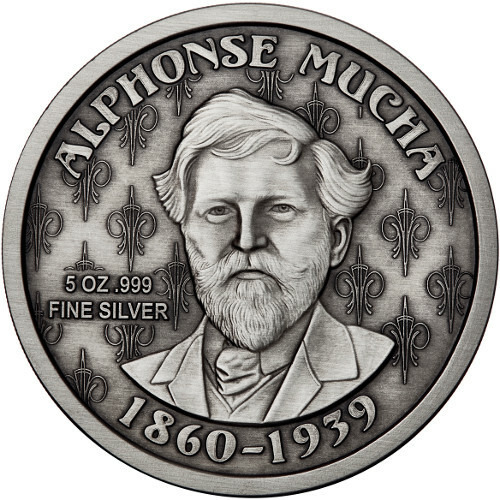 On the reverse of all 5 oz Antique Silver Mucha Collection Dance Rounds is the image of Mucha taken from an actual full-size photograph of the Czech artist. For the round series, a close-up shot of his head was chosen, and is surrounded by engravings of his name, birth year, death year, weight, metal content, and purity of the round. 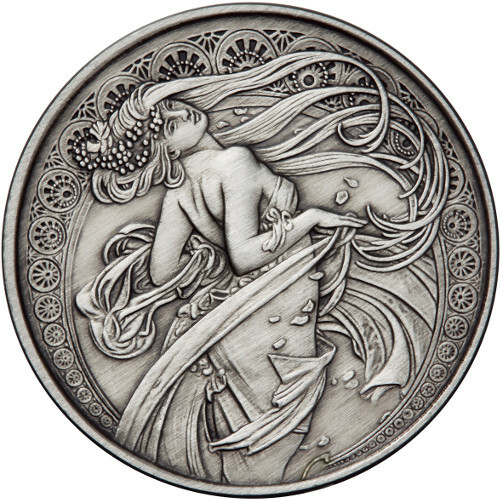 The obverse side of all 5 oz Antique Silver Mucha Collection Dance Rounds include the stunning figure of Dance. She is depicted looking back over her shoulder at you, her figure tight as she stands on her tiptoes while her auburn hair flows in the breeze. Anonymous Mint developed this silver round series with authorization from The Mucha Foundation. The concept for each release was created by coin designer Julie Lindquist and engravings were completed by Italian master sculptor Luigi Badia. Please feel free to reach out to Silver.com with questions about our silver rounds for sale. Our team members are available at 888-989-7223, or on the web using our live chat feature and email address.